Today during the 31 Days of Magic project, I created this carpet page in a notebook I’m currently using to make magic. The goal of today was to focus on a specific color. Now, some of my colleagues are using a specific herb or flower in their work, but as I said yesterday, I’m not doing that. I’m saving that, and tomorrow’s work on making a potion, for Monday and Tuesday due to time constraints. Instead, I focused on a specific color. I wore all black today, down to my socks. I invoked the idea of limits, which is what I usually do with ties on Saturdays. 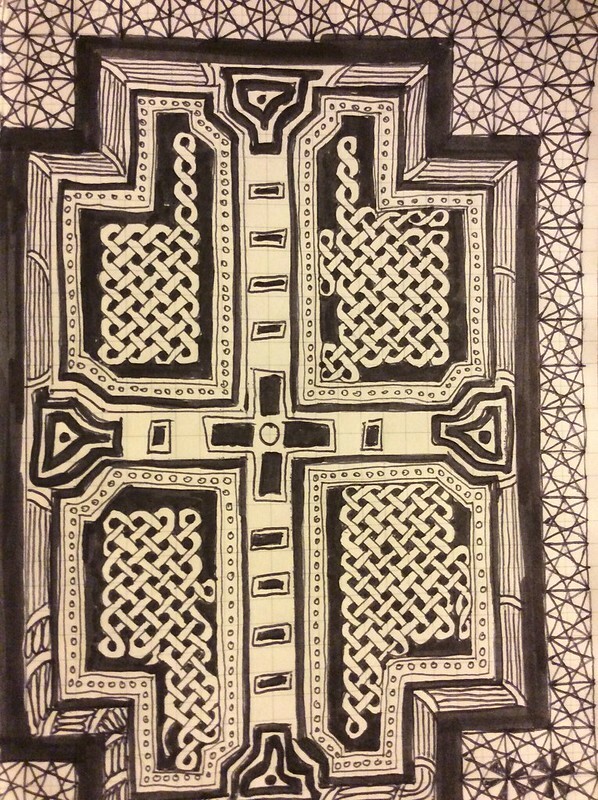 And I finished this doodle, shown above, in black, made up of borders and boundaries inside of borders and boundaries. The design draws upon four cultures and about 1500 years of design aesthetic questions. On the outside is an Arabic/Moorish star pattern, based on the sand-caster’s diagram known from ancient Greece and before. Parts of the design are Celtic knot work, and the frames draw upon on Viking artistic sensibilities, too. Some of the line-work is similar to stuff you see on Maya artwork, but of course a great deal of it draws on the modern Zentangle movement. Because it did. And I must admit, that in magic and in teaching, we tend to forget that it’s not the number of years involved in learning a skill that matters. It’s the number of minutes and hours you actually log doing the skill which matter. Not complaining about how much reading there is, or how much practicing you have to do with your instrument, or how much time you have to spend learning to program a computer, or how many hours you have to stare into a microscope. Skills take work, and neither art nor magic is an exception. Maybe in your color work for these 31 days, you sat and meditated upon the power of black, or blue, or pure white light. But there’s something to be said for the ancient power of pigment on a surface, for the scraping of the brush or the pen on the paper, and the impression of a design by the artist upon the material best-suited to the purpose. It’s relevant to this discussion that Picatrix and other books on astrology establish ancient images in both two and three dimensions for securing power from the stars. It’s also important to remember, I think, that to focus on a single color is to acknowledge its power to tell a story by contrast. To imagine an orange cube, for example, requires knowing the cube’s relationship to other factors: the green ground, the blue sky, the light from the sun or from the lamp on the ceiling. The whole field of focus must be considered. 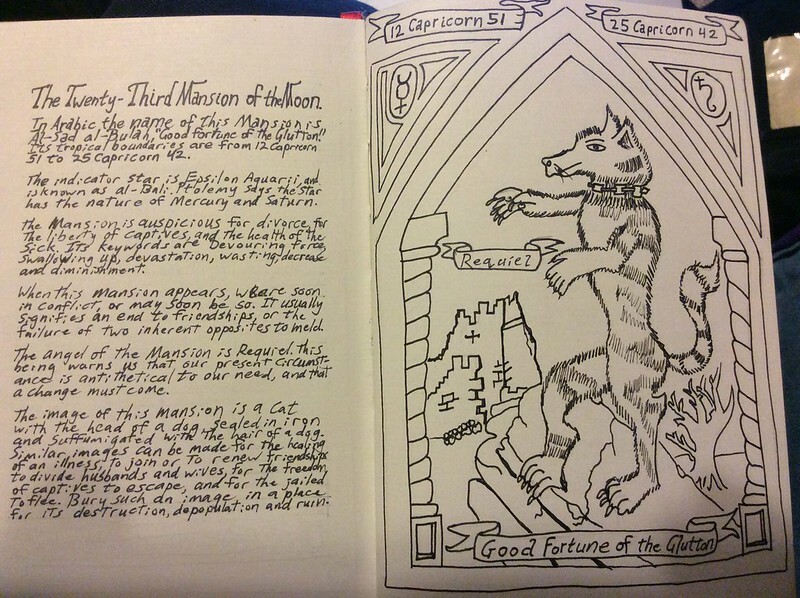 In the image above, not created today, black line work tells a story of the Twenty-Third Mansion of the the Moon: a cat-dog-like creature dancing in the ruins. There can be no focus on black as a color without also acknowledging the white paper ground on which the work is made. The black provides the contrast, even as the white reveals the image as a series of interconnected pieces. Kids don’t learn this material inherently. WE say regularly that “a picture is worth a thousand words” but then we don’t teach kids or adults how to make a picture that can take the place of a thousand words. Visual thinking is a secret superpower, and wizards of old practiced it. Why shouldn’t we? I love your thoughtful, creative mind. This reminds me of one of my favorite beginner painting exercises: to create an entire composition out of one color. You might be allowed to modulate the assigned color with others (e.g., mix some orange into your assigned blue to create grays), or you might only be able to use black and white paints to create shades, but either way, it makes you think about the relationship between your pigments and what you’re trying to represent, shadows, hues, lights and distance. It works with abstract compositions, too. It really forces you to think about color as a force, of design if nothing else.